As we continue looking at our Dreamer’s journey we come next to the Strength card. You may remember that for centuries before 1909 the Rider-Waite (RW) card deck had the 11 card as Strength. In 1909 the 8-Justice and 11-Strength cards were switched. We are halfway through the Dreamer’s journey and at this point, we may be doubting our abilities to complete the journey. While strength brings up images of overpowering another through physical strength, that is not the kind of strength this card is referring to. Instead, this is the strength that comes from resolve and determination. It requires tolerance, patience, receptivity, and in some instances forgiveness. The lion and tiger are used because they are two of nature’s most powerful animals. In both RW and Angel tarot there is a woman with each animal and she does not look afraid. As a card of patience and endurance, we are asked to be patient and show our strength as we weather out challenging situations. If we stay focused on our end goals and do not get sidetracked, give up, or procrastinate; if we have the strength to endure the wait, we will be successful in reaching that goal. 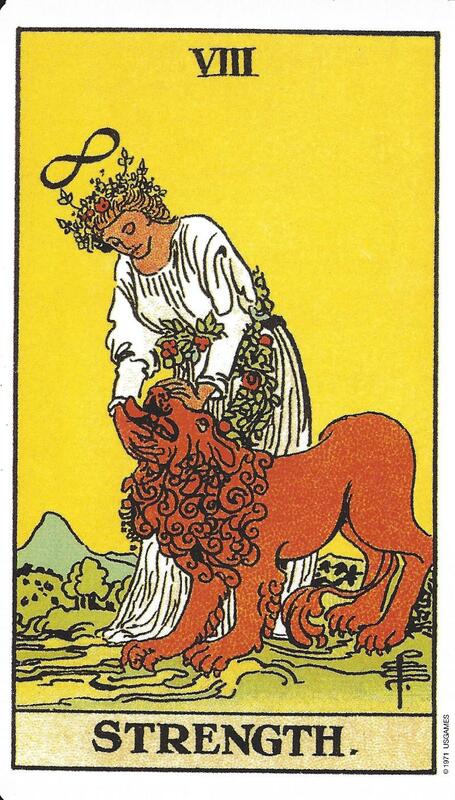 In RW tarot, the woman is putting her hand near the lion’s mouth as she pets the powerful beast. 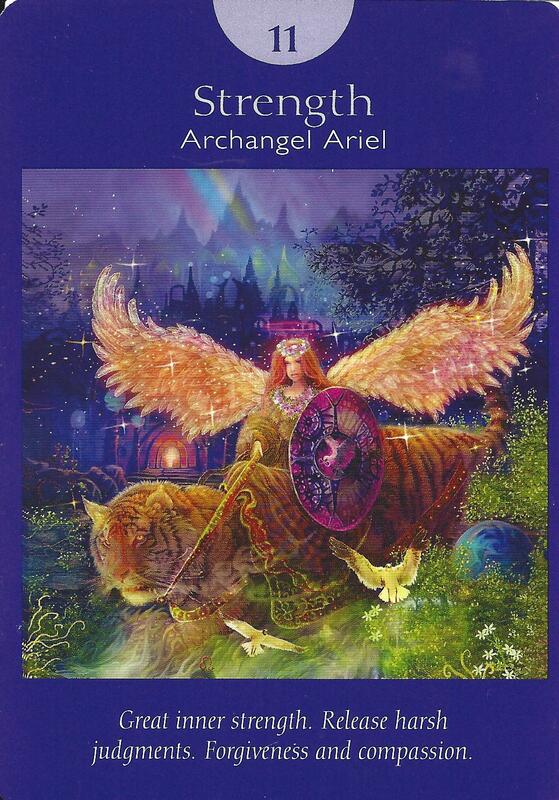 In Angel tarot, Archangel Ariel is riding a tiger because they are allies working together. Archangel Ariel is known for her love of nature. Her name means “lioness of God.” In both decks, there is an infinity sign above their heads indicating that there is no end to the peaceful, quiet strength that each has within. Some say the infinity symbol symbolizes the eternal nature of life. If the Strength card is drawn it is frequently used to show that we are all stronger than we think. We can handle any situation that presents itself. This does not mean to bulldoze your way through the situation, but instead to find compassion and gentleness. We are asked to have a softer strength and in some instances, this can mean an apology or forgiveness is necessary in order to move past the situation. The more we believe in our abilities, the stronger we get.